Germain Ifedi, a first-round pick in 2016, has yet to solidify his hold on the right tackle job as a spotty performance against the Chargers Saturday made clear. George Fant did a little bit of preparing to play right tackle in the spring, when he was still recovering from ACL surgery and was limited to practicing some of his steps at less than full speed. So when Pete Carroll said Tuesday that moving Fant to right tackle this week was part of the larger plan all along, there’s some evidence to back that up. Still, the struggles of Germain Ifedi on Saturday night against the Chargers in Carson, Calif., made it an especially good time to move Fant, who had been repping largely at left tackle. In Tuesday’s practice, Fant appeared to play almost solely on the right side. Ifedi also got work at right tackle, and appeared to work with the starters. But Fant also got some work with the starters at right tackle, a sign that the Seahawks are considering their options. “The comp (competition) is on,’’ Carroll said after Tuesday’s practice. Isaiah Battle, who had been out with a sprained knee last week, was back to practice on Tuesday and will be considered on the right side. But logically, the battle comes down to Ifedi and Fant. Ifedi’s status as a first-round pick in 2016 and the 29 games he’s started the past two seasons — including 16 last year at right tackle — can’t be ignored as the team it makes its decision. Giving up on a high draft pick this early wouldn’t be easy. But Ifedi’s inconsistencies are harder to ignore as he enters his third NFL season. Fant was ticketed to be the team’s starting left tackle last season before suffering an ACL injury in the team’s second exhibition game on Aug. 18, 2017 against the Vikings. Fant has gradually returned to more regular work throughout training camp and saw his most action of the preseason Saturday against the Chargers with 25 snaps. He had 12 the week before. Carroll said the team wanted to leave Fant on the left side — where he had primarily played in his first two NFL seasons — as he got healthy. “That has been the thought all along to get him back moving again, feeling comfortable at the left side, with the thought of him getting over there and competing on the right side,’’ Carroll said. Fant had 10 regular-season starts and two more in the postseason at left tackle in 2016 as a rookie when he made a startling rise from undrafted free agent who had played basketball at Western Kentucky until his final year. “This is what we had in mind the whole time,’’ Carroll insisted of moving Fant to the right side. But Ifedi has also left the door open with his spotty play so far. He was benched or demoted twice during training camp practices for penalties after having incurred an NFL-high 20 last season. Ifedi hasn’t had as many issues with flags of late. But on Saturday, he simply got manhandled or run around by Chargers defensive end Melvin Ingram on two notable occasions, one resulting in a sack for teammate Isaac Rochell, and the other in a hurried pass by Seahawks quarterback Russell Wilson. “He did some good stuff,’’ Carroll said Tuesday of Ifedi. “And he got in trouble a couple of times on things. But he’s cleaned some things up in his game that I am happy about, and I am hoping that will continue. I think it will. But he went against a really good guy, Ingram got after him a little bit. He got after all of us a little bit. He played a really good football game. Ifedi’s issues Saturday came mostly after starting right guard D.J. Fluker went out with a dislocated index finger on the first play of the second drive. Jordan Roos replaced Fluker and played a game-high 47 snaps. Ifedi said after the game that wasn’t a factor, but the right side appeared markedly more vulnerable after Fluker’s exit. Carroll said it’s unclear if Fluker will return for Friday night’s game at Minnesota. He didn’t practice Tuesday. 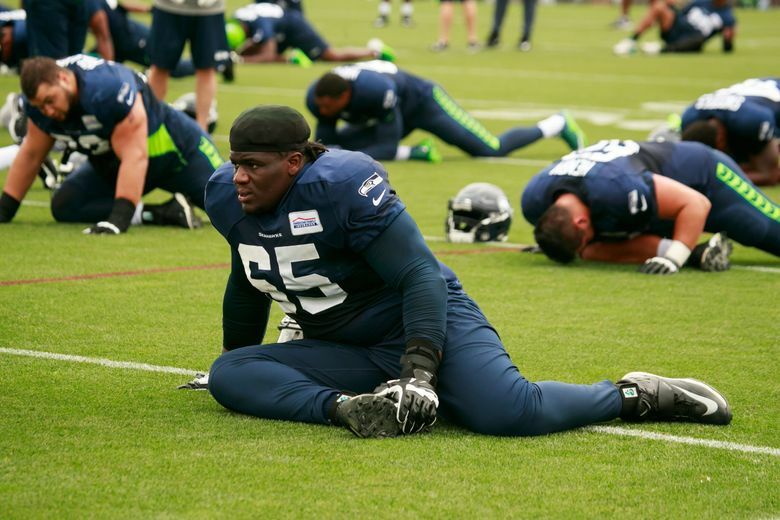 But the Seahawks are preparing for some different options there, with third-year player Rees Odhiambo getting lots of work at right guard with the starting unit on Tuesday after playing primarily on the left side earlier in camp. Intriguingly, J.R. Sweezy, a Seahawk from 2012-15 who re-signed earlier in camp but has yet to play due to an ankle issue, was back at practice and also got some work at left guard. But those appear moves aimed mostly at determining the backup spots with four starting positions on the offensive line appearing set. As for right tackle, the Seahawks made clear Tuesday it’s wide open. — Running back Rashaad Penny was back in pads Tuesday after suffering a broken index finger last week. Penny did not do contact drills and won’t play against the Vikings. But Carroll said there’s a chance he could be back in time for the preseason finale against the Raiders Aug. 30. “He’ll for sure be ready for the (regular season) opener,’’ Carroll said. — WR Amara Darboh missed practice Tuesday to have test on what Carroll referred to as “a clavicle situation.’’ A third-round pick in 2017, Darboh has yet to play this preseason because of a groin issue. — Safety Bradley McDougald sat out with what Carroll said was a pec strain suffered against the Chargers. That had Tedric Thompson and Maurice Alexander most often working as the starting safeties. — Carroll said tight end Ed Dickson, who remains on the Non-Football Injury list with a quad issue, could be back for the opener against Denver. “That’s what we are shooting for,’’ Carroll said. — Carroll said DE Dion Jordan, who remains on the Physically Unable to Perform list with a stress reaction in his leg, is pushing to get back in time for the regular-season opener. “That’s probably ahead of schedule that the docs would say, but I know that’s what he is talking like and he’s going for it and then we’ll make good decisions with the information that we get,’’ he said. — WR Doug Baldwin continues to ramp up his running and Carroll said he remains on track to play in the regular season opener. Seahawks coach Pete Carroll updates injuries and other personnel moves Tuesday.